For this week’s Tuesday Top 5 — where we pause to marvel and share a specific element, image, or detail from events we love — we’re focused on ghoulishly good Halloween-themed décor. We’re all familiar with the typical Halloween party adornments — jack-o-lanterns, ice hands floating in the punch bowl, and spiderwebs galore. Those tired tropes have no place in these celebrations that avoid the expected and instead offer beautifully-wicked spaces filled with gloriously-sinister elements. Here are our favorite Halloween-ready details: creepily creative place cards, an icy graveyard bar, a Day of the Dead-inspired tablescape, devilishly delectable treats, and an eery event entrance. Read on — if you dare. We are wowed by Gilded Group Décor’s luxe take on Halloween at this exclusive dinner, hosted for Miami event planners at the Penthouse at Riverside Wharf. Gold accents elevated the event: gleaming dining chairs coordinated with gold-dipped tableware and gilt French vintage-style balloon chairs, which drew attention to elegant lounge areas. Though it’s hard to choose, our favorite element has to be the table settings. Graphic black-and-white striped linens formed a base for a Mexican Day of the Dead-style tableau. Alan Phillip Photography beautifully captured the pink, yellow, and orange flowers sprouting stark black candelabras. 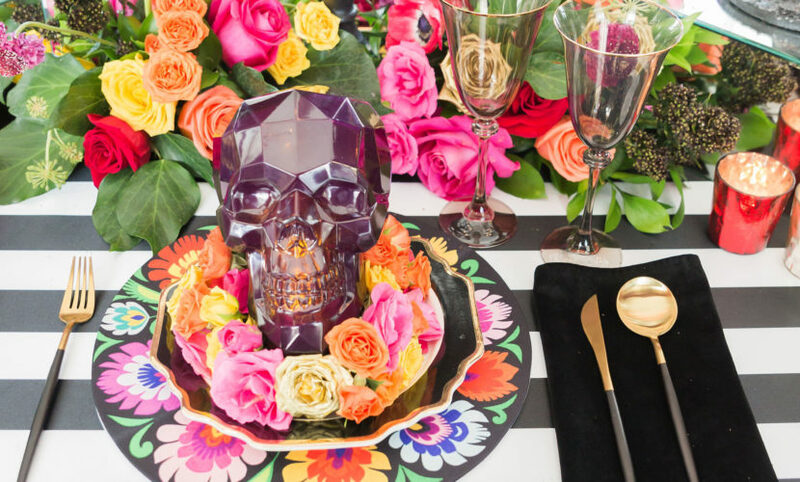 Guests were seated in front of colorful, floral chargers, which Gilded Group Décor outfitted with deep purple skulls lit from within and ringed by fresh blooms. The effect was chic, colorful, and creepy — all at once.